The Scottish Poetry Library will be launching a four week poetry and creative writing workshop at Wester Hailes library on Wednesday 28 February to 21 March 2018, 11.30am – 1.00pm. 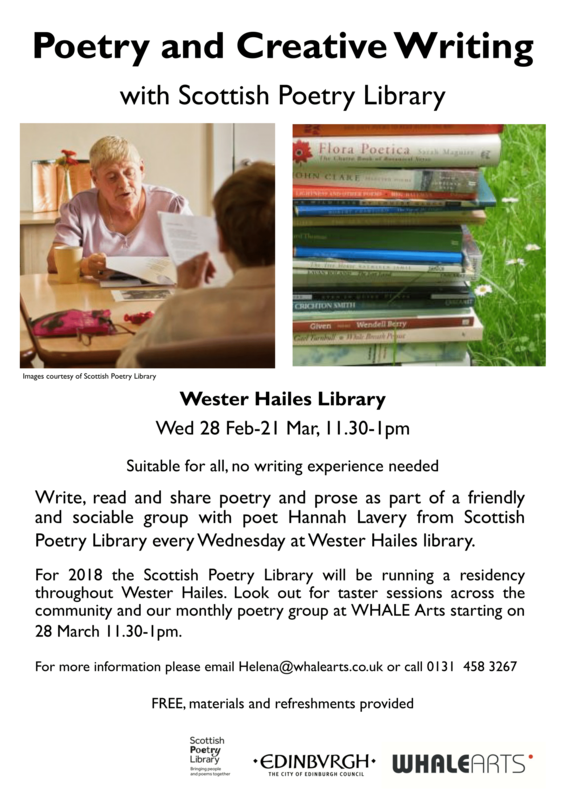 The free workshop, run in partnership with WHALE Arts, is part of the Scottish Poetry Library’s year long residency project in Wester Hailes. The residency also plans to include taster sessions with local community groups and partners and monthly poetry groups at WHALE Arts. The workshop at the library is suitable for all, with no writing experience necessary. For more information or to book your space contact Helena on 0131 458 3267 or helena@whalearts.co.uk.